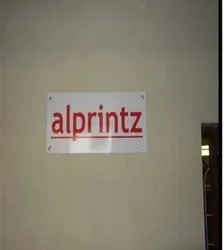 Incepted in the year 2006, We, ‘Alprintz’ are engaged in manufacturing, wholesaling and supplying a wide assortment of Name Plates, Signages, Glow Signs, Advertising Posters and Display Items. Designed with excellence, these products offered by us are widely appreciated for their elegant designs, excellent visibility, corrosion resistance, smooth finish and durability. 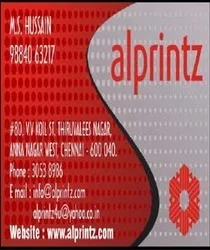 These name plates and signages serve huge application in hotels, office and malls. Being a client centric organization, it is our constant effort to offer only flawless range of Name Plates and Signages to our clients. For that purpose, we ensure to procure only the best quality range of raw materials from reliable vendor base of the industry. With our constant up gradation of manufacturing techniques, we are able to offer innovative range of products. In the present busy world, there is a need for attention catching signboards that are a must. In this aspect, our company is regarded as a specialist in offering the most sought after range of products. These are known for their high clarity, visibility and wide usage across different sectors. We are able to gain a god position in the market segments under the able administration and leadership of Mr. Hussain (Manager). With his enriched industry experience and management tactics, we are able to gain a good reputation in lieu of our counterparts. The philosophy of our organization is to work as per the specification of customers, and satisfy them with result oriented services. We adhere to ethical business policies which creates enough space for clients to deal with us in a profound way. Most importantly, our customized services allow our clients to choose their preferred range of products in terms of shapes, designs and sizes. We believe in building long-term relations with our clients not only for current ventures but also for future endeavors. Our company is able to meet the diverse needs of our clients by offering flawless range of Name Plates, Glow Signs, Signages and Display Items. This is made possible by our state-of-the-art infrastructure facility. We are in the possession of a well-structured manufacturing unit. It is installed with some of the latest and advanced machinery and equipment. These are periodically lubricated and upgraded. 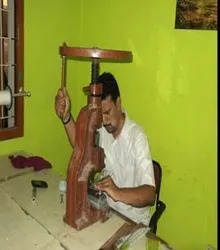 Our highly efficient and skilful workers make use of innovative techniques of production to fabricate defect less range of products.